‘Stormont’ recalls the story of how once rural surroundings have developed into an urban environment. The story takes the form of a journey and looks at the way things used to be. It starts at the Holywood Arches and travels along the Upper Newtownards Road, taking in Bloomfield, Ballyhackamore, Knock crossroads, Stormont, Summerfield, the Ulster Hospital and Ballybeen. 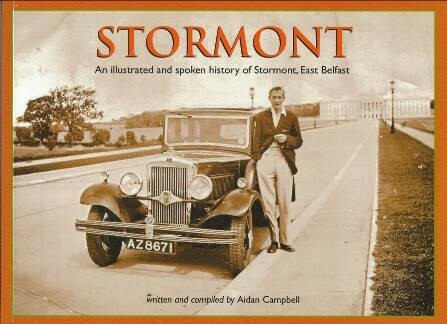 The name of Stormont originates at the present Stormont Estate which was established by the Rev. John Cleland in the early 19th century. In the 1830s a house called ‘Storm Mount’ was described as a ‘large plain house with very little planting about it’. In 1858 it became ‘Stormont Castle’ after being redesigned in the fashionable Scottish Baronial style. The Cleland family left the house in 1893, and the demesne was acquired in 1921 as the site for the new Northern Ireland Parliament. John Auld wrote a history of Bloomfield in the East Belfast Historical Society Journal Vol. 2 No. 3: The first record that I can find of the name Bloomfield is in the Belfast News-Letter of 1784. The old main road out of Belfast went through the area and the first house on it was Orangefield House which was built in 1743; one of the roads or lanes that led to it came off the main road out of town and eventually became a road in its own right-Bloomfield Road. Two large houses called Greenville House and Bloomfield House from which the district got its name are recorded as being in existence in 1780. In the East Belfast Historical Society Journal Vol. 1 No. 3, Louis Gilbert talks about his early life in an article entitled ‘Love in the Black Lagan Valley’: In 1924 when I was a wee lad, I lived off Ravenscroft Avenue not far from the Holywood Arches. There was an electricity sub-station at one end of the street and a school across the road. At the other end, on a high bank, trains from the Belfast and County Down Railway Company’s Queen’s Quay station chugged and puffed on their way to Newtownards, Donaghadee, Downpatrick and Newcastle. There was a level crossing on the Beersbridge Road and the signalman at Bloomfield Station closed the gates and stopped all traffic every time there was a train. Patricia Kernaghan describes the development of Ballyhackamore in ‘From Colm’s Hill, A history of St Colmcille’s Parish, 1890-1997’. Unlike Holywood or Dundonald, Ballyhackamore has no surviving ancient monuments, and was not even recognisable as a village until the late nineteenth century. Despite some ingenious suggestions – the most credible being ‘Baile Achaidh Mhoir’ (settlement of the big field) the origins of the name remain a mystery. Continued development was assured when, in the late seventeen-fifties, it was decided to build a new road between Belfast and what was known at that time as Newtown. The decision was not without controversy; farmers objected to the original plan for the road, which would have entailed too many corners and hills. It was finally built between 1760 and 1770 on a direct alignment. A coaching inn was built at what is now the junction of the Newtownards and Comber Roads. The growing village of Ballyhackamore owed much to the existence of the new main road and became centred on the staggered crossroads, where the main road is crossed by the road from Strandtown to Gilnahirk. The Holywood Arches on a busy day in the early 1940s. Trolleybuses had been introduced to the Stormont route in 1942 and at the request of the Northern Ireland Government, the old tram terminus at Massey Avenue was extended to serve the new Parliament Buildings. 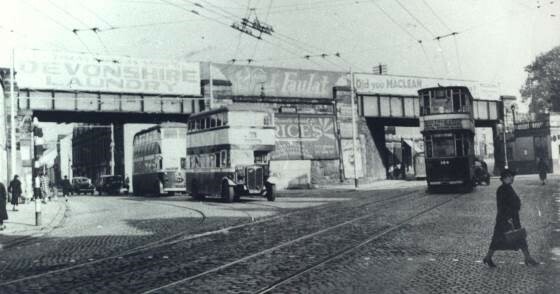 Almost all East Belfast tram services were converted to trolleybus by 1945. This photograph was taken at Neill’s Hill level crossing, heading towards Ballyhackamore, in about 1950. 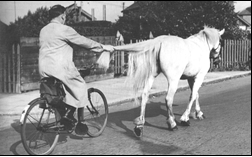 Billy McCrea was the local buttermilk delivery man and here is getting a tow from his pure white mare, ‘June’ who worked loyally with him for 20 years. They were a familiar sight in the area. 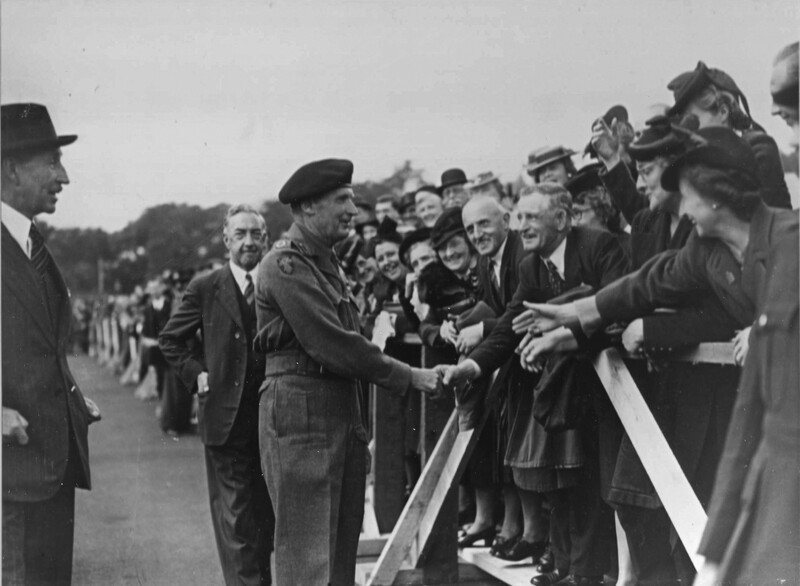 Parliament Buildings has witnessed many fine occasions over the years and here is Field Marshall Montgomery meeting some members of the public at a Stormont Garden Party on 14th September 1945. Montgomery’s Ulster connection was that, although he was born in London and his father was an Anglican vicar and later a bishop, the family lived for a time at Moville in Co. Donegal. We grew up in Summerhill area and I remember June, the milk man and the Milk cart very well. She was a lovely, friendly horse. I have just found your message on my computer so apologies for the slow reply. Billy McCrea was the milkman and owner of June. He lived at Sandown Road. I met Billy’s son John when I was carrying out my research for ‘Stormont’ and he was very helpful with background information about Billy and June. I also met some people who remember that June was put out to pasture (in her old age) in a field on Barnett’s Road and as children they used to feed her too.